Parkasaurus challenges the player to plan, design, and construct exhibits that maximize both their Dinos happiness and the park guests’ willingness to spend money! Starting with only a dream and an abandoned park the player will discover new technologies, new attractions, and a special bond with all their Dinos, all captured in stunningly beautiful modernised 3D flat design graphics. In Parkasaurus fortune is a real possibility and money management is an absolute necessity. The idea for Parkasaurus originated from one of the WashBear wives, who had made a binder of dinosaur management ideas (made out of actual colored construction paper!). From there, the Parkasaurus prototye was created. This prototype continued from a long history of prototypes from WashBear - except this one seemed good enough to share with the world. Made by only two developers in their spare time, they use Unity, duct tape and glue. Only recently have major updates in the Unity engine allowed this game to be possible. 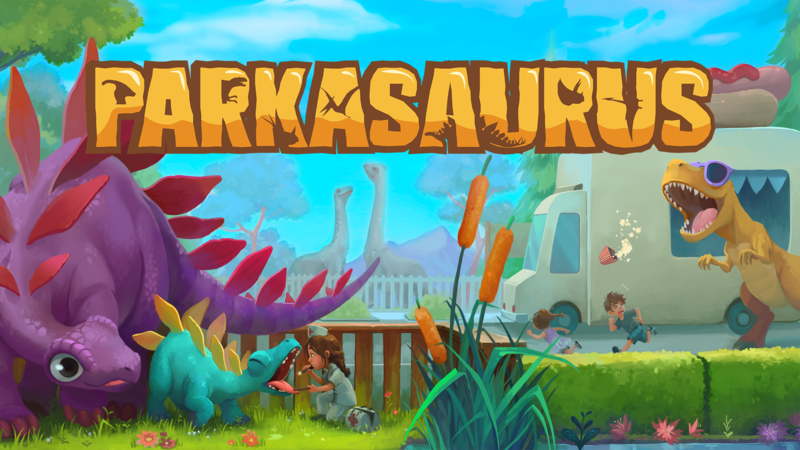 Parkasaurus is crafted with heart, stress, and puppies on our laps. "Build a low-poly Jurassic Park in dinosaur park sim Parkasaurus"
"PARKASAURUS IS ZOO TYCOON MEETS JURASSIC PARK MEETS AN FPS"
"Parkasaurus is a Dinosaur Zoo Management Game from Two Guacamelee Devs"
Please come Wishlist / buy the game, it really helps us out. xoxo store.steampowered.com. WashBear Studio is a small independent studio made up of two veteran game tinkerers originating from the team that created the excellent Guacamelee!, Mutant Blobs Attack and Severed. Currently the two are making Parkasaurus with all their heart. More information on WashBear Studio, our logo & relevant media are available here.